Or HaGanuz, novellae on the Torah according to allegoric, kabbalistic and Chassidic approaches, with a second part – VeZot LiYehuda, novellae on Mishnayot "according to allegoric and kabbalistic approaches, lofty secrets", by R. Yehuda Leib HaKohen of Anipoli (Hannopil). Lemberg (Lviv), 1866. First edition. The book bears approbations of great Chassidic leaders, including the only approbation to a book ever issued by the Tzemach Tzedek of Lubavitch. Another approbation, by R. Mordechai of Chernobyl (the Maggid of Chernobyl), extols the segulah and protective qualities of the book: "Every person should purchase this holy book for merit and excellent protection for himself and his descendants". His sons – R. Aharon of Chernobyl, R. Avraham of Trisk (Turiisk) and R. David of Tolna, repeat in their approbations the segulah for protection that their father mentioned. In the publisher's foreword, the author's grandson likewise cites the protective qualities of the book. The author, R. Yehuda Leib HaKohen of Anipoli (d. 1807, Encyclopedia L'Chassidut, II, pp. 33-34), was a disciple of the Maggid of Mezeritch. According to one source, he was previously a disciple of the Vilna Gaon. Ostensibly, he was one of the four disciples who were at the side of the Maggid at the time of his death (together with R. Avraham HaMalach, the Baal HaTanya and R. Zusha of Anipoli). He and his friend R. Zusha of Anipoli were approached by R. Shneur Zalman of Liadi to approve the Tanya. 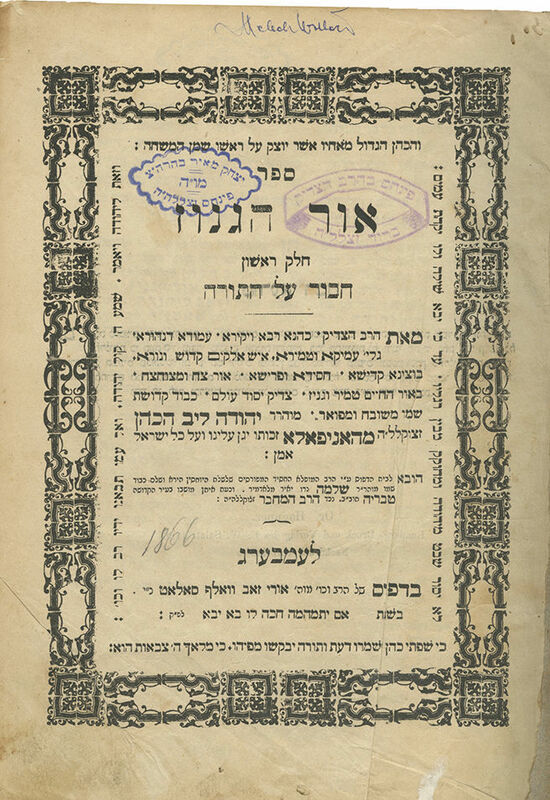 At the time of printing, Or HaGanuz received enthusiastic approbations from prominent Chassidic leaders of the time, including the only book approbation ever given by Rebbe Menachem Mendel of Lubavitch, the Tzemach Tzedek. The book also received approbations by R. Mordechai of Chernobyl and by his holy sons – R. Aharon of Chernobyl, R. Avraham of Turiisk and R. David of Tolna, and his nephew R. Yitzchak Yaakov of Makariv, as well as approbations by R. Chaim of Sanz and R. Yitzchak Meir of Ger, the Chiddushei HaRim. The title page and several other leaves bear stamps of Rebbe Pinchas Hager of Borşa and of his son Rebbe Yitzchak Meir of Sighet. Rebbe Pinchas Hager of Borşa (d. 1941) was the son of Rebbe Baruch Hager of Vizhnitz. In 1893 he settled in Borşa, Maramureş, where he established his court numbering hundreds of Chassidim. He was famed as an outstanding Torah scholar well versed in kabbalistic teachings, a wonder-worker and a great philanthropist. His son, R. Yitzchak Meir, succeeded him as rebbe in Sighet (Sighetu Marmației) until he and his family perished in the Holocaust. Part I: , 12; 84 leaves. Part II (separate title page): 33 leaves. 24.5 cm. Good condition. Stains. Inscriptions. Light wear. Minor worming to first leaves. Original binding, worn.